Home Unlabelled Khan Confident: I Feel This is a Little Bit Too Much For Crawford! 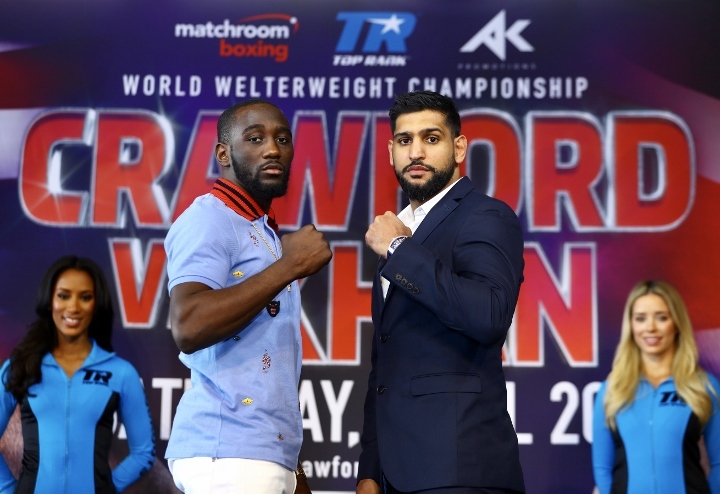 Khan Confident: I Feel This is a Little Bit Too Much For Crawford! British superstar Amir Khan is hoping to pull off a major upset when he challenges Terence Crawford for his WBO welterweight title on April 20th at Madison Square Garden in New York City. The contest will headline an ESPN Pay-Per-View event. The 32-year-old Olympic silver medal winner, and former world champion, is a huge underdog in the fight. Khan believes Crawford has never face another boxer with his skills and experience. The defending champion is regarded by many as one of the top pound-for-pound fighters in the world. This will be Crawford's third fight at welterweight. He began his run as a lightweight, winning a title there and then unifying the entire junior welterweight class. “I think I’m a different fighter than the other fighters he’s faced,” Khan told Helen Yee Sports. “First of all, he’s moving up to 147. He’s had one or two fights in the division against lower calibre fighters, who I would probably beat myself as well. I just feel he’s fighting the best fighter in the division at this time. He’s going to be tested. I’ve got the speed, the power, I’ve got the explosiveness, and I’ve got the size.